Buy Your Season Subscription Today! Performed in repertory. One Cast. Two essential American stories. Considered by many to be the greatest American play ever, Our Town depicts the town of Grover’s Corners in three acts: “Daily Life,” “Love and Marriage,” and “Death and Eternity.” Narrated by a stage manager character and performed with minimal props and sets, this classic chronicles the Webb and Gibbs families as their children fall in love, marry, and eventually – in one of the most famous scenes in theatre – die. In 1998, a university student named Matthew Shepard was kidnapped, beaten, and tied to a prairie fence outside Laramie, Wyoming. When he died days later, the world learned Shepard was targeted because he was gay. 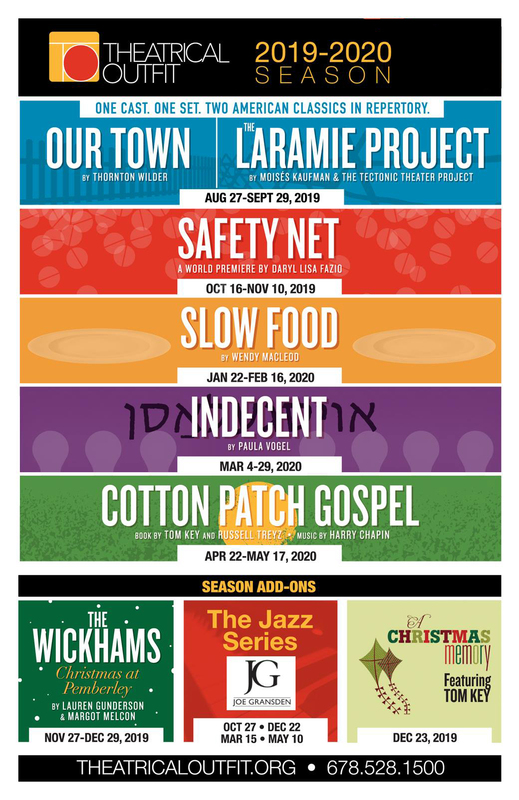 A breathtaking collage of the local residents, The Laramie Project is virtuously determined to find the light in an event of harrowing darkness and exposes the depths to which humanity can sink and the heights of compassion of which we are capable. Chris Dove is the first-ever female fire captain in an Alabama town at war with opioids, and she’s facing it head-on, heart-out, and under scrutiny. Meanwhile, her spitfire-of-a-mother, Xenia, tries to conjure stability with bundt cake and Bible verses. When Chris’ mysterious childhood friend, Val, drifts into their lives, daughter and mother find themselves at a tipping point between what’s safe and what saves. Welcome back to Regency-era romance with The Wickhams: Christmas at Pemberley, a companion to TO’s Pride and Prejudice-inspired Miss Bennet. While the Miss Bennet plot unfolds upstairs, Pemberley’s servants navigate their own scandal down below, as a diligent housekeeper, an indomitable maid, and a lovesick groomsman struggle to control the boorish Mr. Wickham. Gunderson and Melcon’s latest love letter to Jane Austen celebrates family and forgiveness at the time of year we need both of them the most. Irene and Peter just want a quiet anniversary meal while on vacation in Palm Springs, but the evening heats up when a neurotic waiter won’t bring their food, and everything goes deliriously wrong. This fussy server has the couple second-guessing their menu choices, parenting skills, and their very future together. Will their shared desperation get them their spanakopita or end a marriage? Everything (and nothing) is on the table in this zesty comedy about painfully slow service. Inspired by the 1923 Broadway debut of The God of Vengeance by Jewish writer Sholem Asch, Indecent tells the story of a kiss between two female actors (one playing a prostitute, one a brothel owner’s daughter) that led to an entire cast being arrested for obscenity. With vivid theatricality underscored by a live Klezmer musical ensemble, seven actors portray over forty roles in this fascinating exploration of faith, sexuality, and art. The beloved musical returns home just when we need its radical hope – now more than ever. Inspired by Clarence Jordan’s provocative The Cotton Patch Version of Matthew and John and produced and cherished worldwide since its conception in 1981, this soul-rouser with boundless heart sets the story of Jesus in the American South. In downtown Atlanta in 2020, Cotton Patch Gospel promises to raise the roof with joy! Join Georgia-based performer Joe Gransden for four soulfully smooth gigs in our intimate Balzer Theater at Herren’s with his four-piece band along with exciting special guests. Click on a link below to purchase. Single Tickets On Sale July 15th (not including Cotton Patch Gospel). Cotton Patch Gospel Single Tickets On Sale the week of December 2. The above links are for NEW subscribers. If you have a current season subscription and have not received an email with renewal prices, please call the box office at 678.528.1500.